Ho-Chunk Sharice Davids from Kansas won her bid for United States Congress on Nov. 6, 2018. Davids and Deb Haaland, Laguna Pueblo, of New Mexico are the first Native women elected to Congress. Also, Sharice Davids is the first L.G.B.T. Native to serve as a federal lawmaker. Democrat Sharice Davids unseated four-term incumbent Republican Kevin Yoder, Davids had 53.3 percent of the vote to Yoder’s 44.2 percent. Hundreds of supporters gathered at an election watch party in Olathe on election night. The ballroom in the Embassy Suites erupted in cheers after a cable news network declared Davids the winner in the Kansas 3rd Congressional District race. The crowd cheered, “Sharice! Sharice! Sharice!” and tears of joy could be seen on many faces as Davids took to the stage. Emotion and excitement filled the ballroom, Sharice was breaking barriers. Sharice made political history. Davids began her victory speech, “I’m, of course, going to start off thanking my mom - and my two little brothers, who aren’t so little, my aunt Allie, who is here.” Her mother is Crystal Herriage and her aunt is Alice Wood. She went on to say thank you to her campaign staff, team, the army of volunteers, countless organizations, Mayor (Annise) Parker for being at the election watch party, Victory Fund, Emily’s List, and Citizens United. 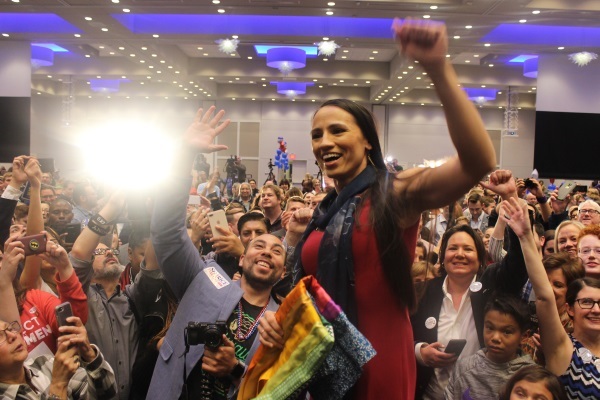 Congresswoman-Elect Sharice Davids said, “From the beginning, this campaign has been built on bringing new leaders to the table and new voices to the table. I am so honored to stand here today knowing that I will fill that role for our community here in January. Davids spoke of Kansas Governor-Elect Laura Kelly and their discussion to make healthcare and education a top priority. Sharice said, “As a first-generation college student, who worked the whole time I was in school, I worked from Johnson County Community College to Cornell for Law School and then on to the Obama White House. And that opportunity stems from access to quality public education. It does. “But the things I was just talking about aren’t uncommon experiences. It is not uncommon to be raised by a single parent, a single hard-working parent. It is not uncommon to be a first-generation college student. No, it’s not. It is not uncommon to work the entire time you’re in school. “What is uncommon, until now, is to have those voices and those stories and those experiences truly reflected in our federal government, in Congress, and in the Senate. We are doing better. That starts tonight. Sharice Davids, a former mixed martial arts fighter, spoke about the past year, the many meet and greets, and the people she’s met. Sharice spoke of, “People like Heather, who dedicated hours to this campaign. She fought off breast cancer and knew that it is so important to make sure that people with pre-existing conditions are protected, and they have access to healthcare. Davids spoke of the many teachers, everyone who works in the public school system, and parents who take care of children. Children deserve all the resources they need in their schools, so they have every opportunity to have a thriving economy and a thriving society, Sharice Davids asserted. Sharice Davids spoke to her campaign staff, team, and volunteers when saying, “We did this. Every door you knocked on, every phone call you made, every phone call I made, and shifts you took. Every conversation you had, even when they weren’t easy, sometimes those discussions are not easy. “One by one, voter by voter - by voter, we shared our stories and listened to other people’s stories. We shared our passion, for things like public education. We shared our commitment to making sure that people have access to affordable quality healthcare and our commitment to making sure opportunity is accessible to everyone. That we are creating opportunity for every single person in our community, in this district, in the state of Kansas, and in our country. Sharice Davids spoke of people who cast their vote for Yoder and come January; she will see every single person. She will listen to every single person. It is important to her that everyone feels represented. Davids thanked everyone for their blood, sweat, and tears that went into the campaign. She thanked everyone for being part of change and for being there (on election night). ‘Ad Astra per Aspera’ translates to ‘To the Stars Through Difficulties’ (statesymbolsusa.org, 13 Nov. 2018). Sharice Davids will join at least 100 women in the House of Representatives next year, the most significant number yet in United States history.